A functional assemblage honoring the memory of my mother, Norma Jean, a wonderful southern cook, who inspired my daughter, Rachael Jennings, to become a professional chef. The picture includes my daughter at the Culinary Institute of America where she wrote a food memory of watching my mother make southern fried chicken when she was eight years old. Some of my mother's handwritten recipes are in the background of the central painting, including her much beloved Sweet Potato Soufflé Recipe. 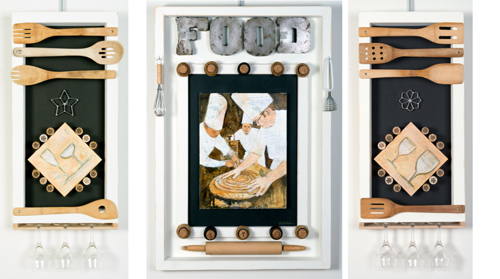 The assemblage is functional in that there are removable whisks and wine glasses. The two side panels have tipped wine glasses honoring Anthony Bourdain who passed the week this assemblage was finished.